Edward Snowden exposed how the American government illegally performs electronic mass surveillance of personal phone calls and emails. 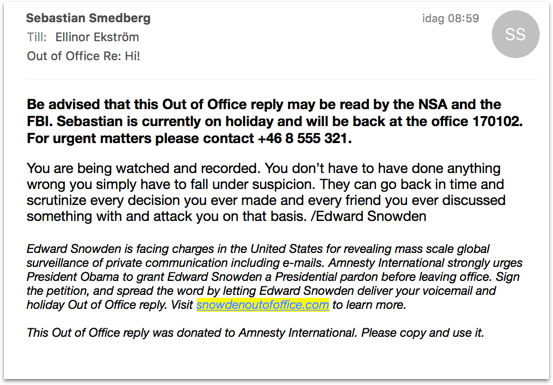 As Obamas presidency was ending, Amnesty made an appeal for a Presidential pardon of Edward Snowden, and needed attention and signatures. We utilized media channels subject to illegal surveillance by the American government: Personal emails, voice mail and out of office replies came with an urgent message from Mr. Snowden himself, paired with the call to visit snowdenoutofoffice.com and sign the petition. More than 1 million people signed the petition for the pardon of Edward Snowden.